For myself, and many of the other business owners I know, it seems that ‘the people’ are the hardest part of business. On the other hand, the right people can really set a business on fire. It goes to show that one of the most important tasks is recruiting the right people. But it’s easier said than done! I’ve definitely made my share of recruiting mistakes and reflecting on my businesses, I thought I’d summarise these here – so that you can hopefully avoid going down the same path. Your applicant might appear to have all the right attributes for the job, but if you have a nagging doubt that something isn’t quite right, trust your instincts! I’ve often been so eager to get the recruiting “done”, that I’ve ignored my gut and justified my decision to hire someone based on more objective criteria. I’ve always regretted it. Often, I’ve been in such a hurry to fill a desperately needed role that I didn’t take the time to consider the future requirements of the business and how this might change the recruiting strategy. (Especially if a key person unexpectedly resigned.) With fast growing businesses, the needs are constantly changing and the type of person and role that worked in the past, may not be the best solution going forward. For example, perhaps a mid-level role could be replaced with a more senior, part-time position, plus a full-time junior person. It sounds obvious, but there have been times when I’ve been so certain about an applicant, that I’ve decided to skip the reference checking step. There have also been other times, when the speed of business has meant that we’ve simply forgotten to do it. Again, on several occasions, this was a costly mistake. It seems contrary to the point above, but I’ve also made mistakes on moving too slowly with applicants – and having them accept other offers before we’ve got back to them! 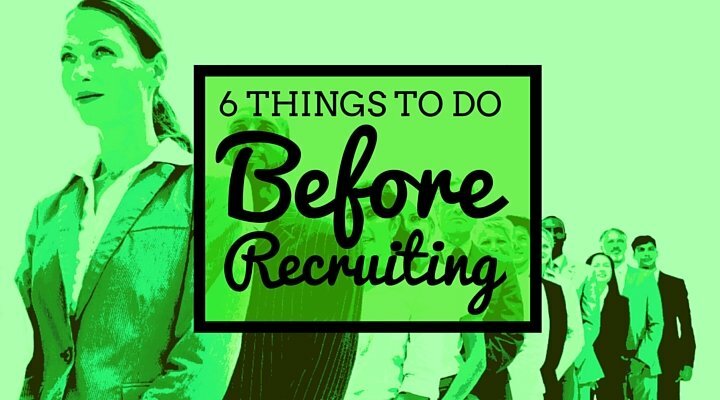 Remember, good candidates are going to be in demand and will usually not have too much trouble finding a job. The key here is to keep in constant communication with them. Even if you need a couple more days to complete their reference checks or re-interview a competing candidate, give them a call to let them know that they’re still in the running. Use it as an way to promote the opportunity at your business too. Lots of businesses are very cagey about the packages they’re offering. There are some good reasons for this (maybe it depends entirely on the applicant, maybe it’s highly confidential information?). Anyway, I’ve had enough situations where I’d conducted several interviews, done the reference checking, decided on the successful candidate, only to find out that there was a huge mismatch between the package we were offering and the candidate’s expectations. We resolved this problem by being much more upfront about the salary range in the beginning – sometimes by including the range in the advertisement, and other times by discussing it during an initial phone interview. I’ve found that extra caution is needed when recruiting salespeople! Even someone that is half-good knows how to sell themselves so you need to have a good radar for their strategies. If you ask them a direct question, make sure you get a direct answer – not “look, put it this way…” as this gives them too much control of the conversation. Take them back to the actual question and insist on an answer. Although not technically a recruiting mistake, I’ve included it here as it happens so early in the piece. There were quite a few times when I was so convinced I’d made the right hiring decision, that I biased my judgement in order to demonstrate I was right. Here’s a tip – if a new recruit is horribly late on the first day, turns up having ignored specific instructions (eg dress code etc), demonstrates a poor attitude within their first week, or has a series of unforeseen and totally bizarre occurrences happen early in the piece… be on high alert. There are certainly times when you need to demonstrate a good degree of empathy towards employees, but in my experience, if any of this shows up in the first week or so, it’s downhill from there. On the other hand, one strategy that has always served me well, but is generally not well regarded, has been to recruit friends. Note, that I’ve never treated this lightly as I would never want to risk straining a friendship, but in all cases, these recruits have worked out really well. I only mention it here because lots of people have a personal policy “not to work with friends” – but I’d urge you not to be too rigid on this. Under the right circumstances, it can work out really well.